Build wealth, ignore Wall Street and get on with my life… and enjoy my cup of Teh Tarik! My retirement portfolio. Please read Disclaimer. To view portfolio return and updates, scroll down to the comments of this page and click the links that you are interested in. I’m comfortable with 75% Equity and 25% Fixed Income. Click to view full size (in pop-up window). The above percentage numbers are derived from the ratios I use below. They are rounded to whole numbers. Using Cash and CPF-SA. Prefer one fund per asset class for simplicity. Global fixed income – 50% iShares Citigroup Global Government Bond (IGLO), 50% iShares Global Inflation-Linked Bond (IGIL). Legg Mason Global Bond Trust is the old holding and will not add anymore. A composite index comprises 75% of Growth Composite Index and 25% of Moderate Growth Composite Index. Both indexes include reinvested dividends and gains, and are available from Vanguard. I use the rebalancing guidelines from the book “The Bogleheads’ Guide to Investing”. Use cash in-flows to rebalancing. Avoid rebalancing by selling funds if possible. To reduce transaction cost, consider delaying the rebalancing until you have held the asset for more than 12 months. The lower and upper limit for both equity and fixed income allocation is minus and plus 5% absolute to the target allocation, respectively. For example, if equity allocation is 70%, then the lower and upper limit is 65% and 75% respectively. The lower and upper limit for subclasses allocation within equity or fixed income portfolio is minus and plus 25% relative to the target allocation, respectively. For example, if 50% of equity portfolio is US equities, then the lower and upper limit for US equities is 37.5% (50% X 0.75) and 62.5% (50% X 1.25) respectively. Very very good blog, just doing the same since November 1999 Using Vanguard index funds and I’shares ETF’s. I have a U.S broker, as we all invested for 40 or more year after my son will have to pay estate taxes. I wants to move my account outside from the U.S.
What do your think about U.S estate taxes. Do you not consider that at 27% you’re not overweight on US Equities. Two reasons I’d suggest; the likely continuation of a weak/subdued dollar combined with probable lacklustre US market performances for some time to come? Firstly, I would like to thank you for your efforts in sharing your knowledge with budding investors. It might mean little to you, but websites like yours provide a little guiding light amidst the noise in the market. I would like to ask you a question: From your portfolio, I notice that your equities are allocated by region (cap weighted). In your opinion, is that sufficient, without further diversifying into small and large cap funds? Welcome. The fund for each region is either a total market fund (large+small) or a large cap fund. So, VTI (total market fund) covers US large and US small. EUN, Lyxor Asia and Lyxor Japan covers large cap of Europe, Asia Ex Japan and Japan respectively. They are all cap weighted. I prefer total market fund (e.g. VTI) and use large cap fund (e.g. EUN) when it is not feasible to get an equivalent total market fund. Am i missing something (e.g. NASH countries) in the VWO that I need to account for? I used Vanguard EM ETF because there was no EM index funds in Singapore. This allocation omitted the NASH countries. After Lyxor introduced APEJ and JP ETFs, I use them to include NASH countries and to reduce the US estate tax issue, and have stopped adding Vanguard EM ETF. This will omit some emerging markets. Yes, there is some overlap but not significant because my Vanguard EM ETF holding is small. 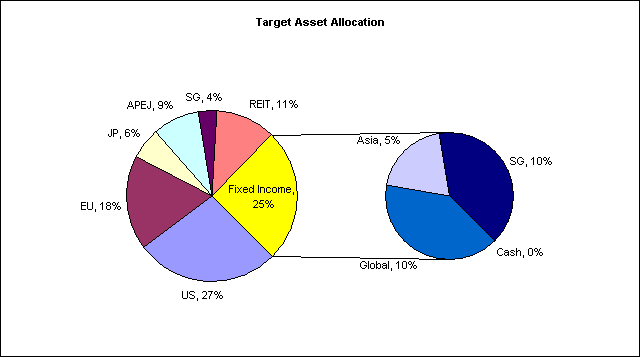 I have posted the changes and my reason in Portfolio asset allocation update. EM market cap is about 10%. So you have to decide whether to allocate 25% to EM. NASH countries and JP is not included in your allocation above. For global market cap distribution (2007), see this post One-liner for my global equity allocation. Hi Serendib, I have only bought Vanguard ETF through Optionsxpress and other brokers – no problem with that. As for Vanguard mutual funds, I asked optionsxpress in 2006, they replied: “Singapore accounts are not able to purchase mutual funds. ” It looks like that it remains so. You might want to check with other brokers as well as with Vanguard. Lyxor Japan and Lyxor Asia Pacific Ex Japan. CDP would mail the dividend in USD cheque. Do you claim the USD check as SGD or deposit in some USD account to be used for future investment. I got a USD check from CDP and not sure which is the best way to claim it. Thanks. You can open a USD current account with most of the banks here to deposit the cheque. But they have a minimum balance requirement of USD 1000 – 5000. I deposited the cheque from Lyxor Japan into my SGD savings account because the amount is very small and not worth the trouble to maintain USD 1000 in a USD current account. My cheque was cleared at UOB on 23-Jan with a forex rate of 1.4938. As I had USD400 in cash with me (due to business travel), I finally decided to open USD account at UOB. I topped up the balance in SGD to meet USD 1k min requirement. I think, in long run, it is worthwhile to hold USD account for investment purpose. I have also decided to open an account at Saxo Capital with USD as the base currency. I plan to use Saxo Capital only for ETFs that are in USD. In this way, I think I will not get subjected to currency conversion when I get dividend payment and when I sell ETFs. Then, I will probably use DBS Vickers or some other brokerage to buy other ETFs in SGD. panther, thanks for the info. FYI, SGX stocks/ETFs bought through Saxo Capital are held in Saxo, not in CDP. So you can only sell them through Saxo. Sorry for the many questions. I am just thinking, is it possible to use CPF-SA as fixed income, so that I can allocate more cash to buying equities, i.e. For the cash holdings, the equities:fixed income ratio can be higher (e.g. from 70:30 to 80:20). Since CPF-SA will be part of CPF Retirement Account when you reach certain age, I include it into my retirement portfolio. And since it gives 3-4% interest a year risk-free, I use it as fixed income. I can invest it in CPF-SA-approved funds but I don’t like their high expense and active management. One exception is that I invest all of my CPF-SA into UOB Growpath 2040 before the lock-down of CPF-OA & SA on April 1, 2008. For rebalancing, I leave CPF-SA untouched. If the portfolio needs more equity, I put my new funds into equities. If the portfolio needs more fixed income, I put my new funds into fixed income funds, instead of CPF-SA. I am tired of monitoring and investing in local stocks as it is time consuming and no global diversification. I probably have 15 more years to work and invest before retiring. I approached dollarDex and was given a portfolio that probably achieve 9.5% yeild per annum at the end of 15 years. I am not familiar with ETF and unit trusts but keen to look into ETF and low cost funds. 1) what would the annual yield be if using your portfolio as reference at the end of 15 years? 2) you are usign vanguard, lyxor, ishares… what is your view on db x-trackers as it seems to have ETFs cover many assets classes? 3) which ETF (traded in SGX) is closer to Vanguard Total Stock Market ETF (VTI)? Can I consider using db x-trackers MSCI USA TRN ETF (its investment objective is to replicate the MSCI USA Total Return Net Index) to replace VTI? Good that you look into ETF and low cost index funds as they remove stock selection risk and fund manager selection risk. 1) No one can forecast precisely the return but an *ballpark* figure on return can be estimated using the table in http://www.portfoliosolutions.com/f-13.html . For the current stock/bond split of 75%/25% in my portfolio, the expected return is about 7%. Given you have 15 years to invest (a short duration), it is better to err on the conservative side and allocate more bond and accept a lower return than a risky higher return. Or consider other alternative to fund for retirement. 3) DB x-trackers MSCI USA TRN ETF can be a replacement for VTI. The differences are that VTI has lower expense ratio and distributes dividends quarterly. DB MSCI USA has higher expense ratio and does not distribute dividends, which are reinvested into the fund. These differences are subjective and personal preference. Hi Choozm. Thank you for your helpful reply. One thing which I’ve been curious about is your equity:fixed income ratio. When you say 75/25, do you mean you’re sticking to it for the whole 25-30 years? Or do you actually have some plan (not documented here) which increases your fixed income allocation as the years go by (e.g. according to age)? Yes, it is according to age. I plan to change the 75/25 allocation by stepping up the fixed income allocation by 10% every ten years, over the years. I see that you’re using brokers to access foreign markets. However, in light of recent listings of US ETFs on the SGX, would you reconsider your decision and start to purchase ETFs on the SGX instead? And oh, by having so much foreign equity, isn’t it a little risky, especially given that you’re exposing yourself to currency risks? My investments so far in the Vanguard S&P 500 through optionsXpress has exposed me to losses due exclusively to the fall in the dollar (the USD value of my S&P 500 mutual fund investment still remains the same). The US ETFs on the SGX are swap-based ETFs, in that they don’t hold the actual stocks, but use swap to exchange for the return. They are different from traditional ETFs, such as VTI. You can google “swap based ETF” for more. The Lyxor ETF that I use for Japan and Asia Pacific ex Japan equities are swap-based. I still use VTI for US equity so that I don’t have all ETF in the swap-based type. If I remember correctly, currency effect is negligible over long term, as given in “The Intelligent Asset Allocator” by William Bernstein. Hi choozm, I see! However I went to look around at the SGX listings and found that iShares ETFs are cash based. I tried to contact the SGX and iShares for more details whether S’pore investors are subject to estate taxes for SGX listings, but did not get a reply. Wonder if anyone has gotten a reply from anywhere? I think United Asian Bond Fund is an investment grade asian bond fund. Do you think United Asian Bond Fund is a suitable replacement for ABF Pan Asia Bond Index ETF ? I am considering to use United Asian Bond Fund as my asia bond fund. Please share your opinion. Thanks. Both United Asian Bond Fund (UABF) and ABF Pan Asia Bond Index ETF (PAIF ETF) contains non-investment grade bonds (e.g. Indonesia and Philippines). The difference is that UABF also contains corporation bonds besides government bonds, while PAIF ETF contains only government bonds. The other difference lies in the expense ratio and investment style (active vs. passive). I use PAIF ETF because of the passive style and I want only government bonds. The non-investment grade government bonds in PAIF is a risk I am aware and willing to take. Another ETF option is the new ETF in SGX: iShares Barclays Capital Asia Local Currency Bond Index ETF (N6L). This ETF differs from PAIF in that NL6 does not include China government bond and the index methodology caps each country at 25%. Read the prospectus for more. There is a dicussion thread on this ETF in sgfunds. Hope this helps. Just an update: iShares didn’t reply me, but when I called their office a British guy answered my call. He assured me there wasn’t estate tax, although he said to be extra sure I should consult my tax attourney. I went to email SGX, IRS etc. all bounce me around. Thanks for the update. I also emailed ishares last week and didn’t get any reply. May be I should also call them up. I have called iShares Singapore to clarify the dual-listing and estate tax issues. 1. If the S&P 500 ETF is bought in Singapore, then it will be deposited, by default, into CDP. 2. When a person sells the S&P 500 ETF in Singapore Exchange and it is already held in CDP , it will be withdrawn from CDP by default, unless the person requests to transfer to DTC and sell through US exchange. 3. On the estate tax, the iShares staff can only say that the ETF is considered “US-domiciled” and we will have to see if the estate tax is imposed on location of fund (US) or location of person (Singapore). The staff could not advice further. Hi Zach – do you see enough liquidity iShares ETFs (buy-sell vol) in SGX. Also,. how big are the assets under management? Just came across this old post in sgfunds: http://www.sgfunds.com/index/viewtopic.php?p=54220#p54220 about iShares MSCI Singapore ETF. According to the post, its dividend is subject to 30% withholding tax. I believe it is because the ETF is domiciled in US exchange. Anyway, its expense ratio is also high and there are alternatives in SGX for Singapore ETF..
Hmm which means to say investing in US is still not feasible. And they wonder why the ETF market is not taking off! Briefly went through your portfolio. Your allocation and re-balancing rationale is good, there is no one right answer. Individual risk & preferences differs. My only concern is that have you considered passive vs synthetic ETFs? As you know, the type of ETF determines the fees/cost of owning them. As far as I know, the only true passively managed, index ETFs are from Vanguard and State Street Corp. When you mention passive and synthetic, I presume passive means traditional ETF that holds the actual stocks in the index, and synthetic means swap-based ETF. I use both passive ETFs (Vanguard and iShares) and synthetic ETFs (Lyxor). I would prefer all passive ETFs but few are available in Singapore Exchange. I started with passive ETF in overseas exchange when there were very limited choices of ETF in Singapore Exchange. But there are estate tax implication in using overseas ETFs. So when there are synthetic ETF in Singapore Exchange, I use some of them for asset classes like Japan and Asia Pacific ex-Japan. May I know what are the tax implications for an ETF domiciled there in terms of dividend withholding tax, capital gains tax or estate duties? I have tried searching online without any success. dividend withholding tax = 0% but your broker may charge you, so ask for refund. Having read the link, am I right to say that what determines taxes is the domicile of the fund? On the other hand, if they are listed on LSE but domiciled elsewhere, then the tax impact depends on tax jurisdiction in the place of domicile? My apologies I am pretty new to this. I tried clicking the link in your post on more information about ETF listed in London Stock Exchange but it returned an error. dividend withholding tax = 0% because it is Ireland domiciled. The above are found from Google. It is best to consult a tax adviser. The shortest and surest route to top-quartile performance is bottom-quartile expenses. -- John Bogle in Common Sense on Mutual Funds, page 393.